Here Comes Trouble is Michael Moore's blistering anti-memoir, a hilarious book tracing the origins of his political rabble-rousing and his early forays into campaigning for change. Michael Moore has been called an iconoclast, a maverick, a vital dissenting voice and a one of the most un-American people alive. But what made him the man he is today? In his sensational and provocative 'anti-memoir', Moore reveals the family, friends and amazing events that have shaped him: from teachers and Senator Robert Kennedy to parents and the Vietnam War. Here Comes Trouble might just be the most hilarious, provoking, inspiring, poignant and important non-autobiography you ever read. 'A comic genius' Independent 'Moore is a wake-up call, a call to action, a kick in the mental backside' Guardian In addition to his work as a bestselling author, Michael Moore is the award-winning director of Bowling for Columbine, Fahrenheit 9/11, Sicko and Capitalism: A Love Story. He lives in Michigan. 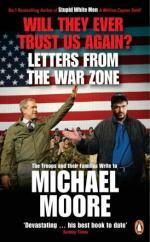 In addition to his work as a bestselling author, Michael Moore is the award-winning director of Bowling for Columbine, Fahrenheit 9/11, Sicko and Capitalism: A Love Story. He lives in Michigan.